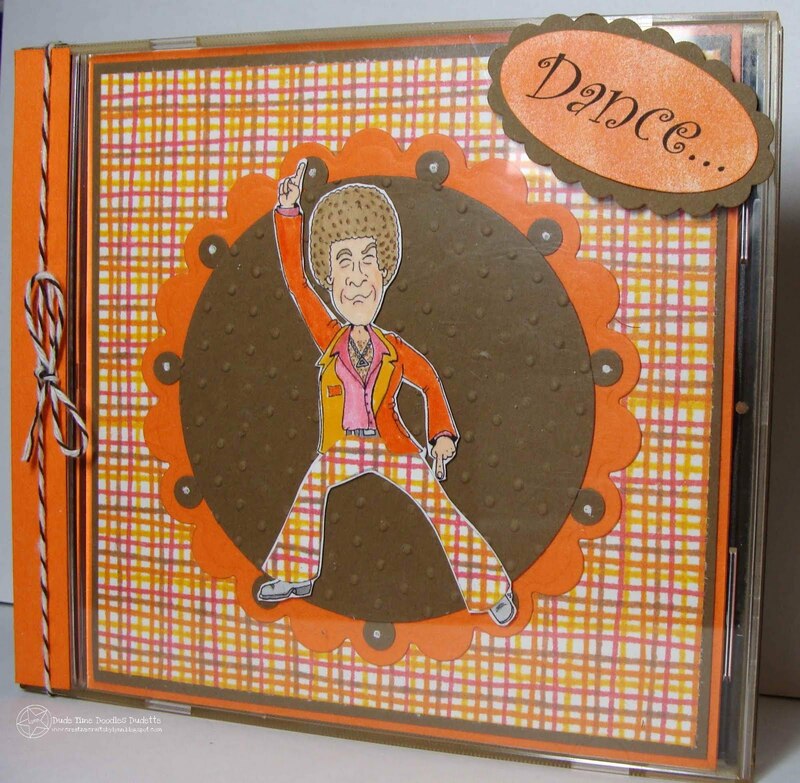 Herman Hustle is dancing up a storm - and all we can hope for is that No One Is Watching! I altered a CD case and put Herman, in his cute little orange and pink outfit, on the front cover. 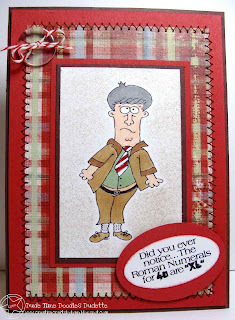 I paper pieced Herman's britches, cut him out, and popped him up inside the embossed nestie. Inside I added a computer generated sentiment. I really tried to add a few notes to the inside along with the sentiment but I'm just not an artist when it comes to drawing (I'll leave all that to Boni, Lou, and Marlene! )...so just use your imagination and think about notes being placed around the sentiment! LOL! Herman is just one of the new releases from Dude Time Doodles that you can find in Boni's STORE. Check our our Blog Hop and you'll see all the images worked up into some wonderful creations! 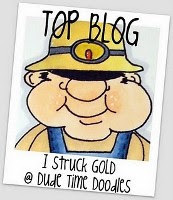 Yep, it's BLOG HOP time at Dude Time Doodles. The Hop doesn't have a starting and ending point, so no matter where you are, you're in the right place. Be sure and leave a little love at each stop because one of the DT members will the the Mystery Hostess of the Hop and one lucky commenter will win! AND WE ALSO HAVE SOME NEW DT MEMBERS!!!! WooHoo! 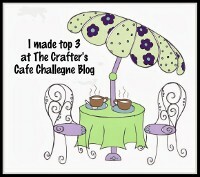 If you've come from Dawn's blog you're in the right place - and your next stop on the list is LINDA! In case you happen to get lost along the way, here's a list of all the DT members and their creations: Anne, Janet, Cleota, Michelle, Ruth, NanaConnie, Boni, Dawn, Lynn (that's me), Linda, Tammy, Ginny, and last but not least is Dude Time Doodles. Again, be sure and leave some love at each stop with a special SHOUT OUT to all the new DT members! 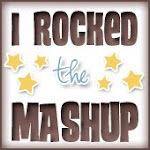 Thanks for stopping by............and hop all around the Blog Hop now! 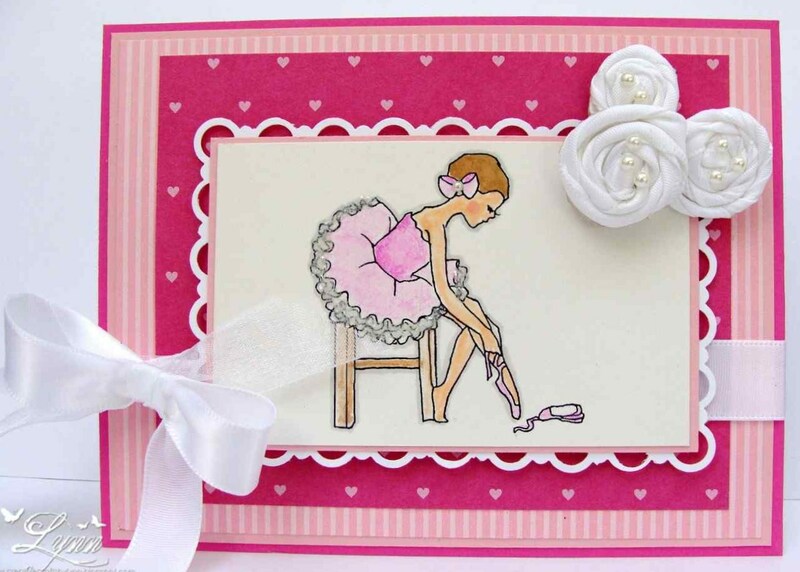 There once was a little girl - who grew up and became a wonderful ballerina! 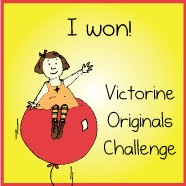 The theme of the challenge beginning today over at Stamps R Us Challenges, is...."there once was a little girl". You have two weeks to submit your entry and could be chosen as the winner of A Day for Daisies images (our wonderful sponsor)! So head on over there today. This is NOT ME - for a couple of reasons. First of all, I'm not a ballerina, have never been a ballerina, and will never BE a ballerina! I always wanted to be one, but was usually too busy playing baseball, shooting BB guns, catching tadpoles, and stuff like that, so just never had the time to do it! I do think it's amazing what a ballerina can do and I love watching. The second reason this is so "not me"....I just don't do very many "girly" type cards and am never good at all the flowers and fluff, etc. 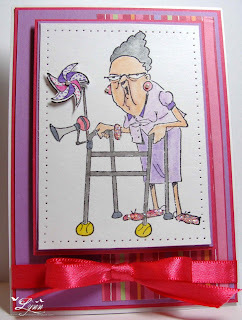 BUT, to your amazement (AND MINE), these little flowers on this card are handmade!!!!! Since we live so far from any type of craft store, I just can't buzz over and pick up some pretty flowers like you see on a lot of cards. I decided to make some after viewing several tutorials. These are SUPPOSE to be Rolled Ribbon Flowers....mine are more TWISTED ribbon flowers! LOL! What can I say - except I was very glad to get them completed and they didn't come undone and go flying all over the place before I could get a picture taken! The image from A Day For Daisies is called Pink Ballerina. 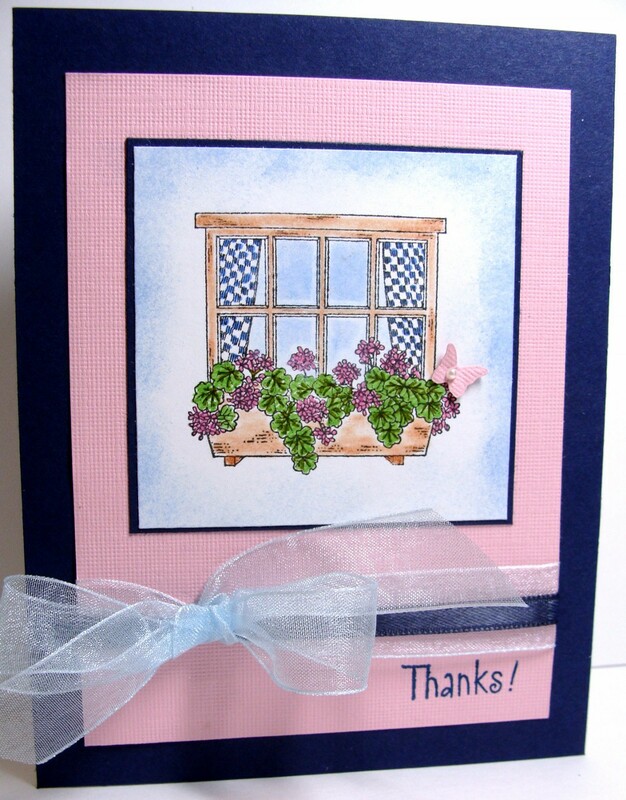 The image is water colored on some sort of off-white watercolor paper to give a little contrast between the image and the ribbon and flowers. 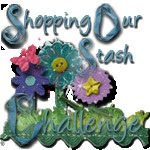 Thanks for stopping by.........and be sure and check out Stamps R Us Challenges today. 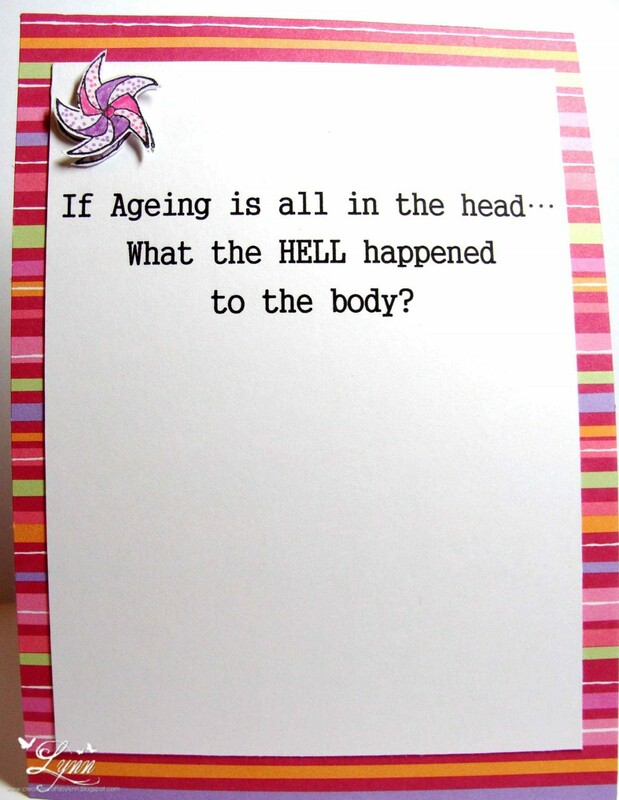 Let me tell ya.....there are some days, my "bod" feels like it's about 95 years old. LOL! Some of you know I've been having a problem with my shoulder/arm/neck....They FINALLY found out it has something to do with my brachial plexus (too complicated to go into here) but I had to go to Physical Therapy for several weeks. Pain in the buns I'm telling you. So that's it for a Funny Friday - and maybe I'll have another one next Friday too! 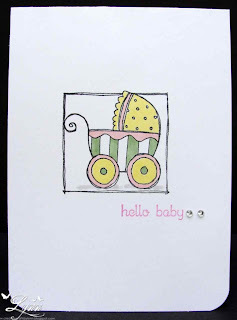 This is just a short post - and a clean and simple baby card I made. 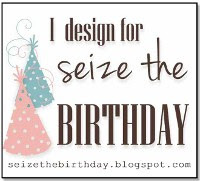 The image is from Hero Art Baby Love set and the sentiment from Teeny Tiny Wishes (SU). As a change of pace I used my Water Color pencils and Aqua Painter for the coloring on the image. My main problem here was trying to get a good picture of this! I finally ended up using a black back-drop. When I tried to use white behind the card, I just kept having parts of the card disappear due to my lighting I guess. I learn something new every day about this craft). I'll enter this in the challenges at The Paper Players (C&S Sketch) and Clear It Out Challenge (C&S). I'd like to introduce everyone out there in blog-land to Mr. Shrinky Shep. I can just hear him now...."Um, I think wifey must have thrown my clothes in the dryer on high setting!" Then wifey turns around and says, "You old fool, you're just getting a little chubby!" LOL! No matter how you look at it though...Either the clothes are shrinking or Shep is packing on the pounds. And as that sentiment says.....In Roman numerals, 40 is XL! 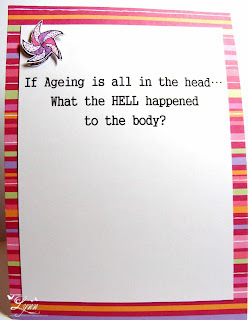 This ADORABLE image is from the fabulous Marlene Shaw whose blog is called Disguised As A Grownup. If you haven't seen it yet, be sure and check it out. And now for some wonderful news!!! Flash!!! Marlene is joining Dude Time Doodles as one of the artists!!! Yep, you heard right. Head over to DTD and check out the interview with Marlene and Lou and read all about it! 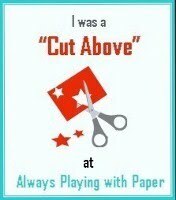 I even drug out my sewing machine and stitched around some of that My Minds Eye patterned paper for the occasion. The sentiment is from TLC. And of course, I had to add a little Baker's Twine to that clear button. 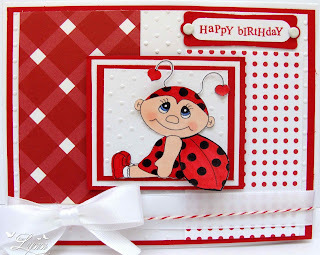 I'll be entering this is the challenge at Catch the Bug Blog and Paper Creators Crafts - both have masculine themes this week. 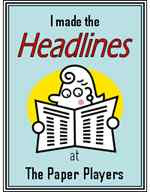 Be sure and head over to Dude Time Doodles to read all about Marlene.. If you look real close you'll see that cute little naked fairy sitting at the top of this flower! I just really can't think of a better place to park my "bod" to take a short nap either! Especially if the weather ever cools down - wouldn't want to sunburn my bottom, you know! LOL! 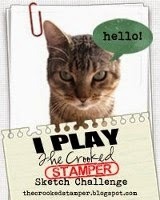 This was one of the Repeat Impressions stamps that I received last week from Connie over at Grammy's Attic as a RAK. So very sweet of her to send me this. Thanks again, Connie. She also told me about the site The House That Stamps Built - and I thought this image would fit perfect in the sketch challenge they're having right now. 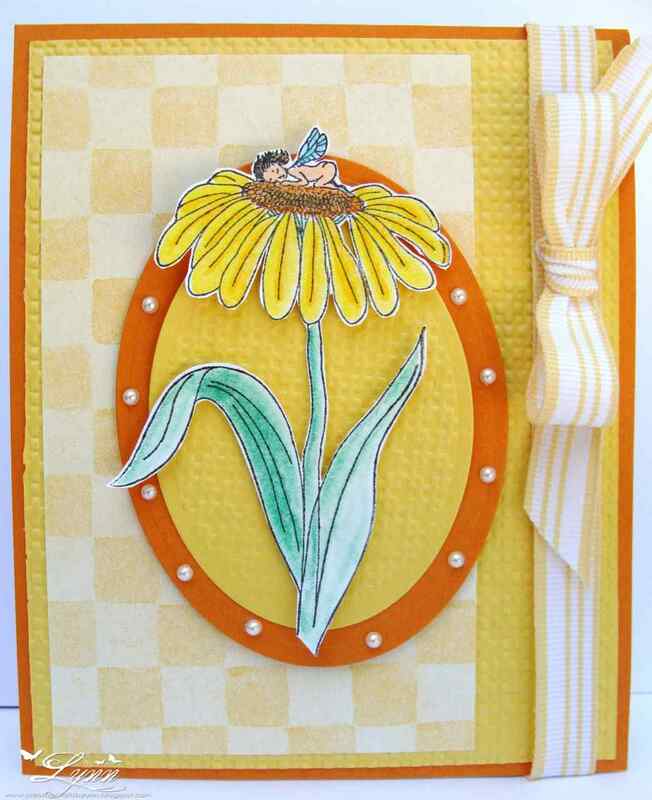 I used the Square Lattice embossing folder on the yellow oval behind the image and the background yellow. I originally added some large pearls around the larger Pumpkin Pie oval, but then changed them to a size smaller as the large ones were just overpowering! The image was colored with Prisma's. Still working on that. I didn't add a sentiment as it could be used for several different occasions. Hope this cute little Basset hound puts a smile on your face for the weekend! I think most Bassets are usually more of a white color with brown or dark colored splotches on them. But, this one is all brown - mainly because I just wanted it to be! That cute little face kind of contradicts the sentiment that says "You Make Me Smile/Have A Great Day", but just looking at him makes me smile. I colored the image with Prisma pencils and added a couple of tiny little pearls to the flowers on the hat. The Night of Navy panel was embossed with the Square Lattice from SU. This is for several challenges today. 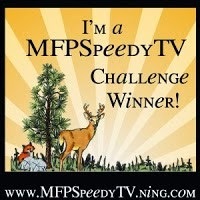 Rubber Redneck has a color challenge to use Old Olive, Night of Navy, and Daffodil Delight. 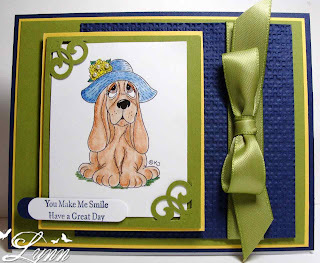 At Karen's Doodles the challenge is to "Frame It" (and by the way, this is one of those cute, cute images from Karen's Doodles). 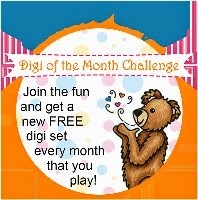 And last by not least, the challenge at Scrapalicious is "Smile"! Hope everyone has a wonderful weekend. We're just going to have a HOT one! Yesterday it got up to 105 degrees and today it's suppose to be up to 106. Now come on, that is just WAY TOO HOT! Well, here we are at another Friday - and no "funny Friday" again! What's going on with me anyway! Actually, I just wanted to make a card for all the dads/fathers out there and say "hope you have a great day on Sunday". 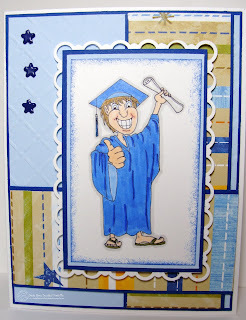 The image is from In Wilderness (SU) and I stamped it over the Sanded background stamp on Very Vanilla. The sentiment is also SU from the Teeny Tiny Wishes set. I also used some Baker's twine and a brass/pewter looking button I had in my stash. The card base is out of Kraft. 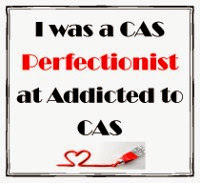 Very CAS - but I like it. And, of course, it'll fit into several different challenges that are honoring our fathers/dads this week..........like Party Time Tuesday and Paper Take Weekly. Just a clean and simple "butterfly" card for you today! Now I've never actually seen a blue butterfly with pearls on his body...but I bet he'd be pretty! 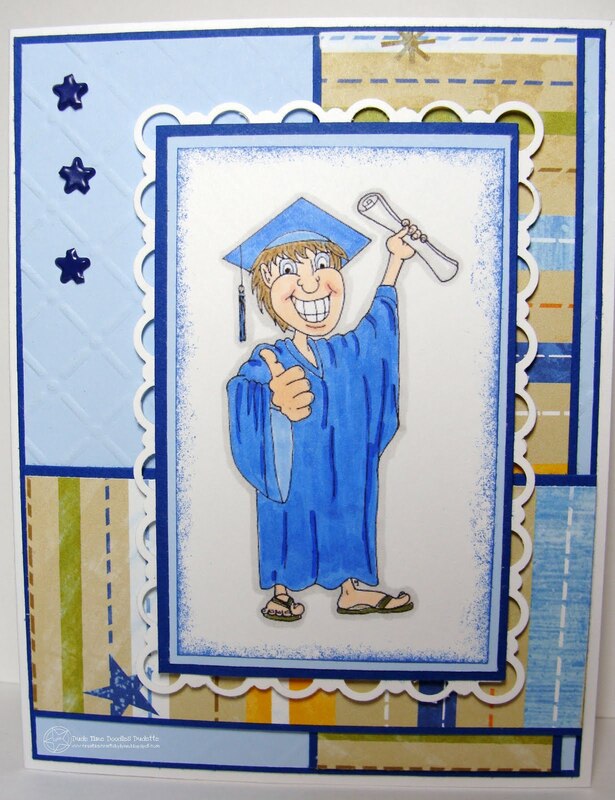 I like the card - but then I like almost any card with blue on it. 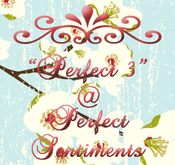 The only thing stamped on here was the sentiment (from SU's Three Little Words set). The butterflies are just punched out with a SU punch, attached, and the wings "fluffed out" - I used some CTMH paper for them. 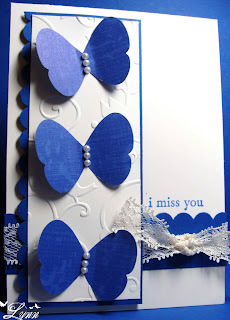 The white panel behind the butterflies was embossed using the Birds and Swirls from Provo Craft. The lace was a "find" from the Thrift store. And you don't even have to tell me this....that's one ratty looking knot tied in the lace but after the fourth of fifth attempt to get it to look good, I finally just gave up and decided I wasn't working for Hallmark so it was ok!!! LOL! 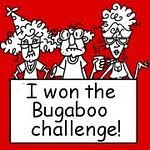 I'll enter this in the challenges at The Paper Shelter (punches and dies) and Stampavie and More (butterflies) and Catch the Bug over at Bugaboo (pearls and lace). 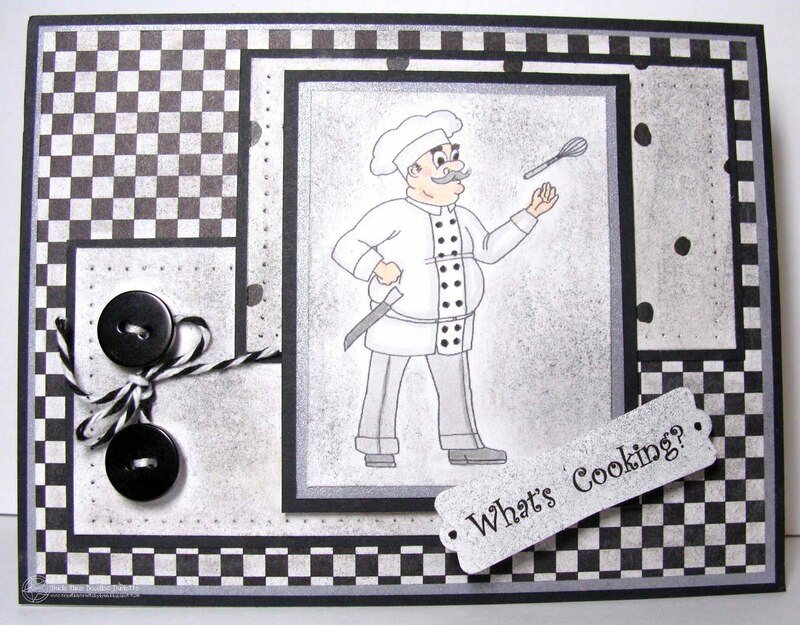 The challenge this week at Dude Time Doodles is an Inspiration Challenge - AND made it Monochromatic! Take a look at this photo and see what you can come up with and then head over to Dude Time Doodles and enter for a chance to be named the Top Blog or one of the Top Three! Plus, I'm sure a prize awaits the winner too. You're not required to use an image from Boni's store but it MUST be a masculine card. This was so hard for me it wasn't even funny!! I kept wanting to add some green or red or yellow - or ANY other color - but a challenge is a challenge.....so .........I used Chef Burley Becky that you can find in Boni's store. He's a happy little chef and a cute, cute image. 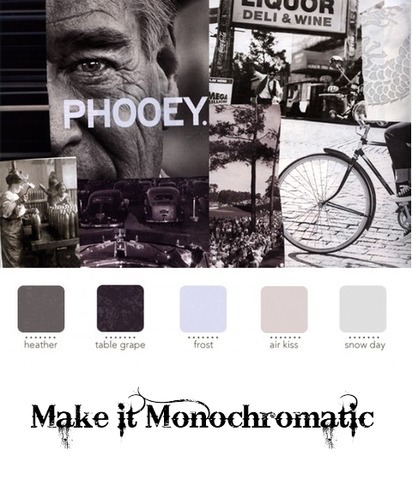 I used some black, silver, gray, and Very Vanilla..and did a lot of sponging! I added the button and the baker's twine and printed out the sentiment on my computer. Thanks for stopping by.....and be sure and check out the Dude Time Doodles challenge today. 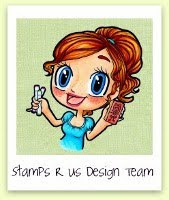 It's time for another challenge over at Stamps R Us and the theme for the next two weeks will be 1-2-3...meaning, one image, two patterned papers, and three embellishments! 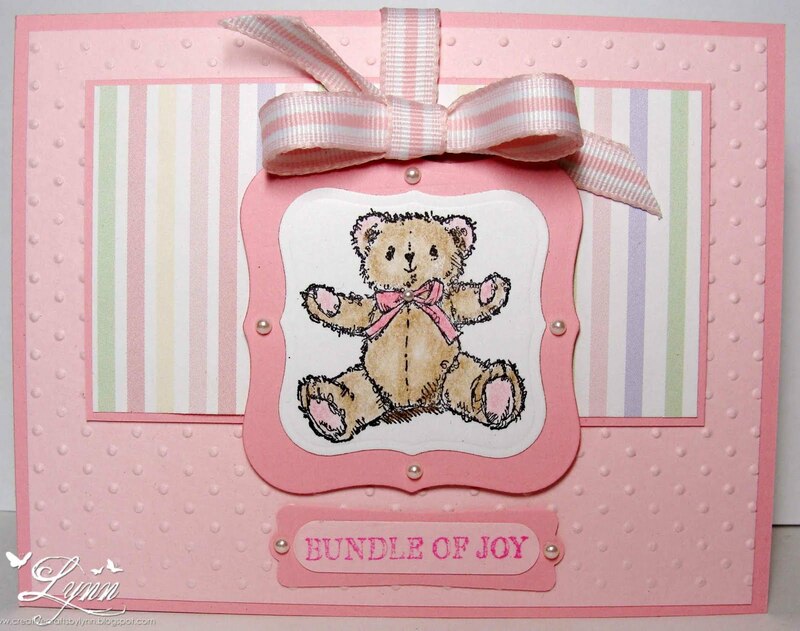 I can always come up with the three embellishments and one image - but mixing two patterned papers is a toughie. 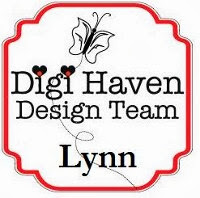 Maybe that's why it's always best for me to buy paper packs, etc....Anyway, our sponsor is Digital Delights by Louby Loo and she has given the DT precious images to work with. 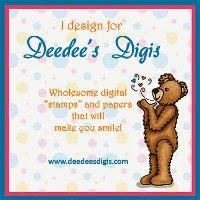 Be sure and check out her store for cute images. 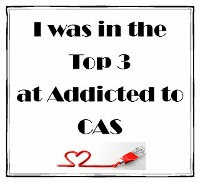 You have two weeks to enter and the winner will receive a very nice prize package...plus the top three will be awarded a badge to go on their sidebar. 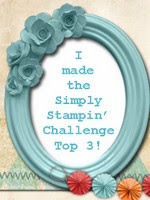 So head on over to Stamps R Us Challenges and enter today. This little cutie is named Lara Ladybug (from Digital Delights) and I cut her out, popped up another wing, and then colored her with Bic Markers. The DP is some scraps I had in red.. I embossed the white background and also the square with the image in it...the sentiment is from CTMH, Happy Birthday set - and after adding the ribbon, I ran some red and white Bakers Twine over it. 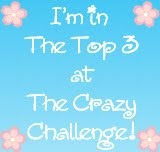 Thanks for stopping by......and don't forget to check out the Stamps R Us Challenge. I used some Night of Navy and some unknown pink textured card stock. 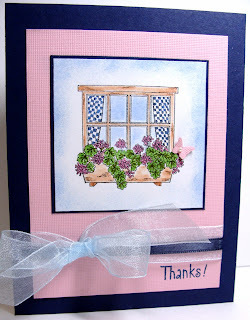 The image is from Pots, Plant, and Posies and the sentiment from Everyday Sayings - both by Hero Arts. The image is colored with Prisma pencils. The tiny little butterfly is from the Beautiful Wings die (SU) and I added a tiny pearl to its body. 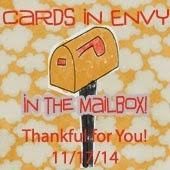 I'll enter this in the challenge at The Paper Players....theme of "Kind Thanks". No Friday Funny today (sorry!) 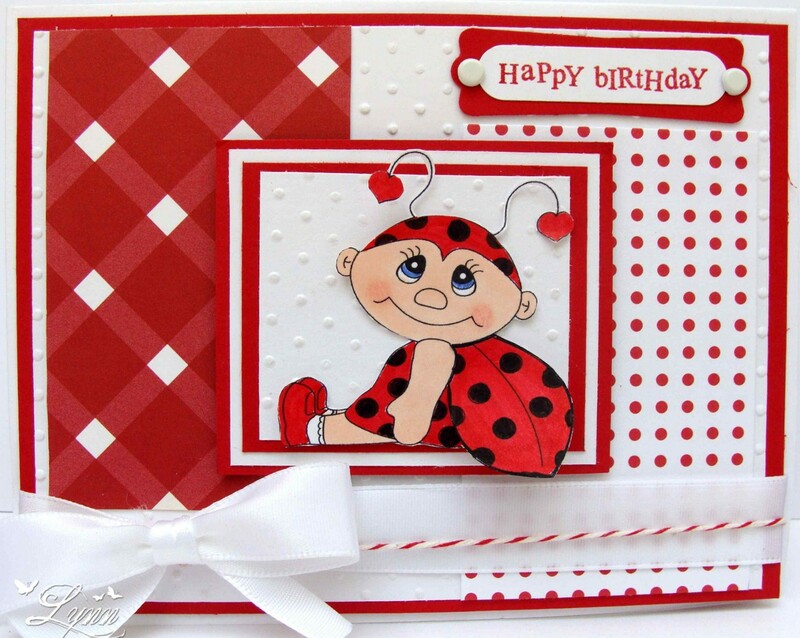 but I wanted to show you a baby card I made for a very special little girl named Sabrina. A former co-worker of mine who is in her late 40's just had her first baby several weeks ago and they named her Sabrina. She was born with a hole in her chest and parts of her intestines, her liver, etc....floated up through that hole and into one of her lungs. They operated early last week and miracle upon miracles have occurred!! Sabrina is doing well now and trying to learn how to feed. She's still on some IV but is now breathing on her own. Hopefully they'll get to bring her home soon! It just never ceases to amaze me what doctors can do now. The cute little bear that I colored in Prisma Pencils is from the SU set Teddy and Train. I used several different colors of pink and the sketch is an old one from SCS. Excuse that wonky little bow...I just could not get it to lay right on the card. 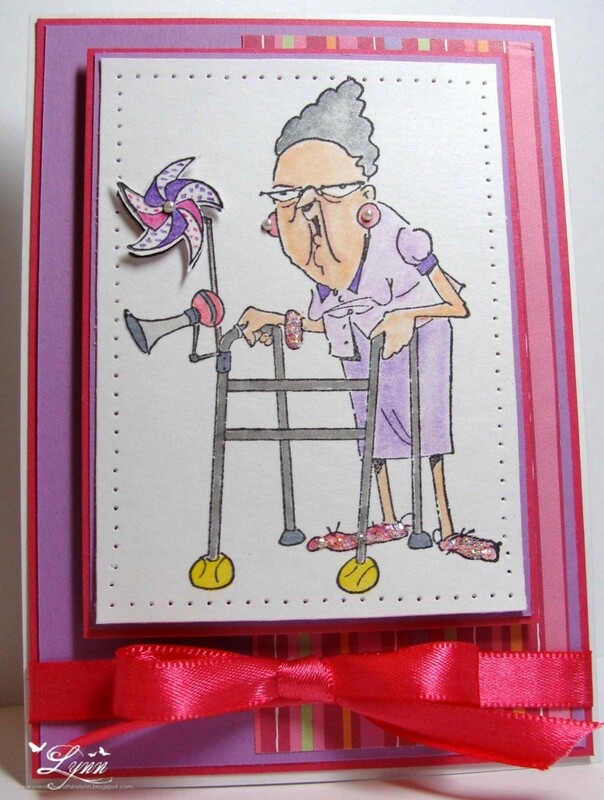 I know this is a very simple card but am hoping mom and dad like it. I have TWO cards to show today! I know, this is just unheard of from me - Right? But today is a very special day - a card for OWH and one for Dude Time Doodles! 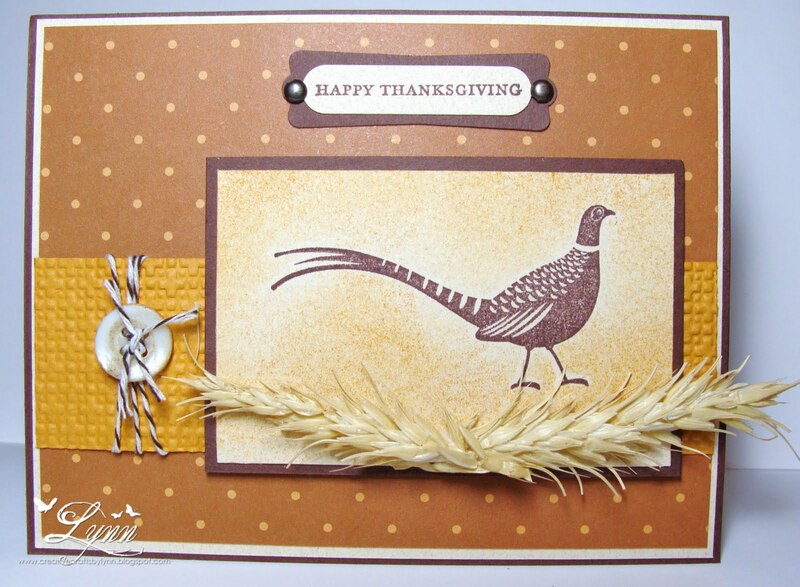 I was asked by Jan to create a card for the Operation Write Home Mid Week Throw Down with the theme of Thanksgiving. I know that no one is really thinking about that yet, but yes, it's time to start creating those cards so OWH can send them to our troops overseas. I've used an older sketch from OWM and an Autumn Days stamp from SU. This is fairly simple and free of a lot of embellishments as it will be going in my box for OWM. The wheat under the pheasant is REAL! A short story here - the guy that has the field next to our house planted some wheat last year and due to it being dry-land farming and no rain, it never got much over about 6 inches high. It did "head out" though and when he cut it, so much blew into our yard! I sprayed it with a clear acrylic sealant before placing it on the card so it won't crumble in the mail. Be sure and check out OWH. 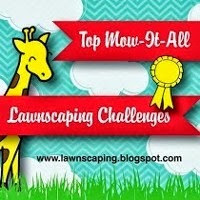 I'll be entering this in the challenge at Tuesday Throwdown (animals). 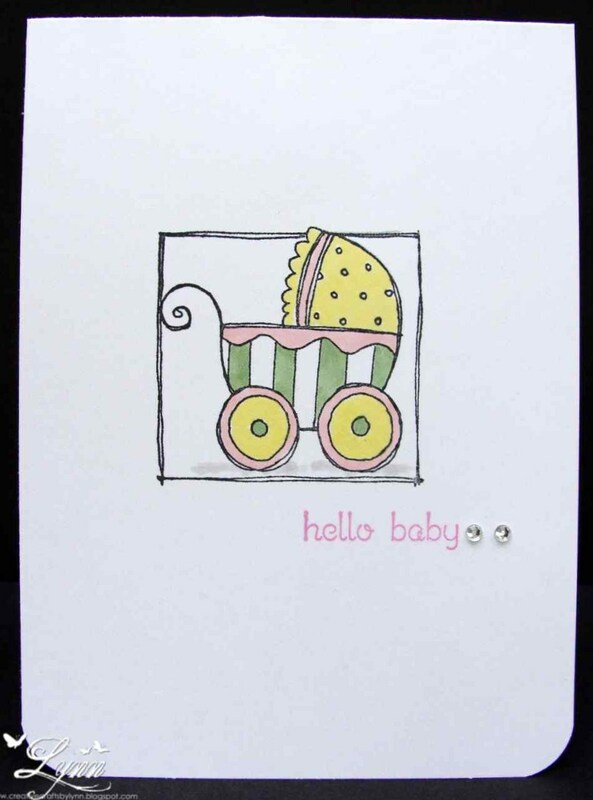 My second card uses another one of those cute, cute images from Boni - and it's a FREEBIE!!! 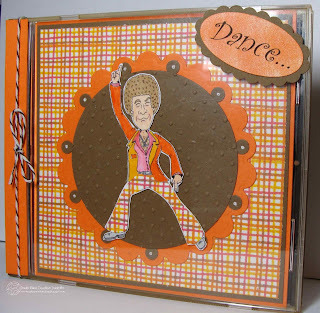 Check out Dude Time Doodles today and pick up this cute (and FREE) image - then create something using the image for a chance to be the next Guest Designer at Dude Time Doodles! Also, note that Dude Time Doodles is having a Design Team call ..... get all the details on the blog. We're a fun bunch of ladies - even if I say so myself. 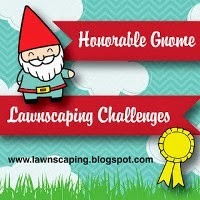 I'll enter this in the challenges at Fussy and Fancy (for a man or boy) and Woodware USA (masculine). I WILL get all my Christmas cards completed before December this year......I WILL get my Christmas cards completed before December this year! Maybe if I keep telling myself that, it'll happen! 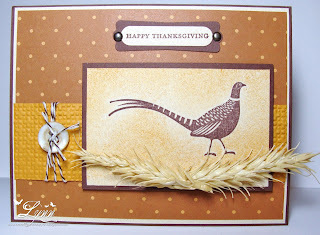 This was a very CAS and quick card using that pretty Scrollwork embossing folder again. 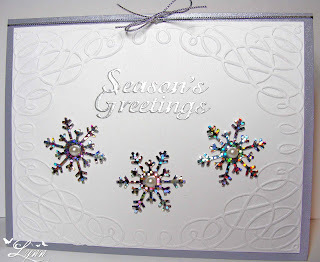 I heat embossed the sentiment that's from Stampabilities with silver embossing powder and then punched the snowflakes in some type of paper that looks silver, then blue, then pink, etc.....I'm sure that paper has a name but it's beyond me right now. 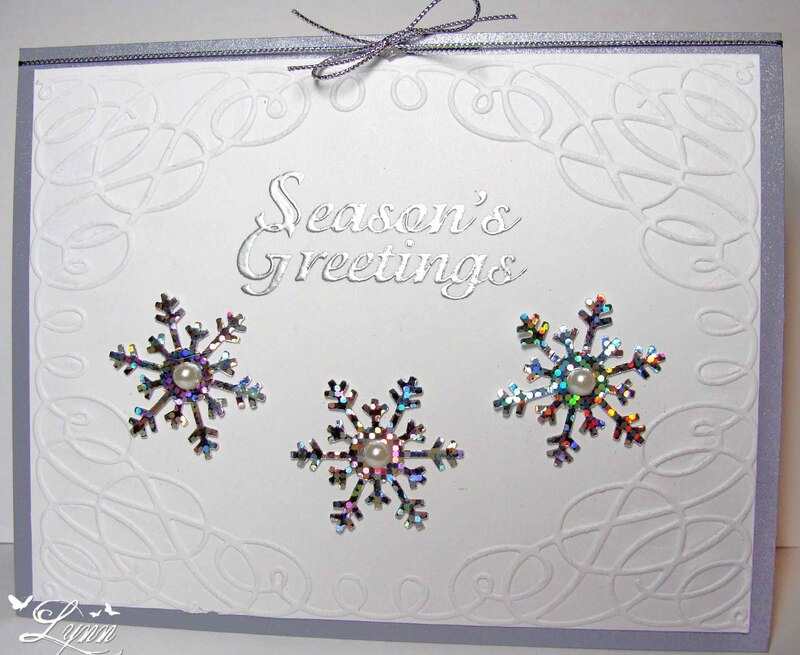 I also put a little pearl in the center of each snowflake. 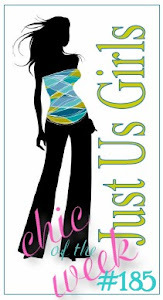 Also just a quick note of thanks to a couple of ladies for two different blog awards that I received in the last few weeks. 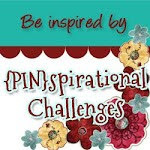 Be sure and check out their wonderful blogs when you have time - and be inspired - Shawna over at Paper Kisses and Inky Wishes and Dixie at EmbelliButtons. Thanks to both of you fabulous ladies for this. 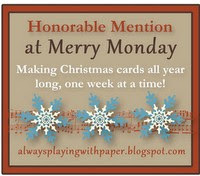 And as I always do, I'll pass the awards to all who blog - you provide me with so much inspiration each and every day. I'll be entering this is the Southern Girls Challenge that has the theme of "start of Winter Christmas". How about a little summer fun today! Yep, I thought I'd give you another Friday funny! Maybe it'll put a smile on your face for the weekend....and hopefully everyone has a great weekend. We're even going to do the ole BBQ bit on Sunday (but no, Jim and I don't dress like this to cook) and think this will make a cute invitation! And believe it or not, summer is upon us. We got up to 103 degrees one day last week! So what better time to have a BBQ. This stamp is from Art Impressions Stamps and I'll be using this card for their challenge this week which has the theme of "summer". I colored this happy little couple with Prisma pencils and copics. 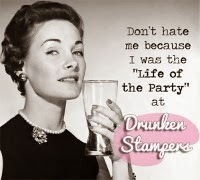 The sentiment is from Kitchen Sink Stamps. Hey, I even cranked up the old sewing machine for this one and stitched around that patterned paper. 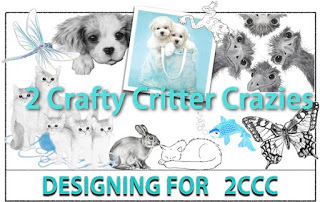 I'll also enter this in the challenge at My Time To Craft that has the theme of "very funny".....and these guys are really funny, but oh so cute! Since it's the first Wednesday of the month, it's time for the Sketch Challenge over at Dude Time Doodles! 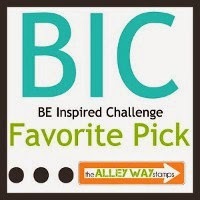 You have one week to work the sketch and submit your creation . 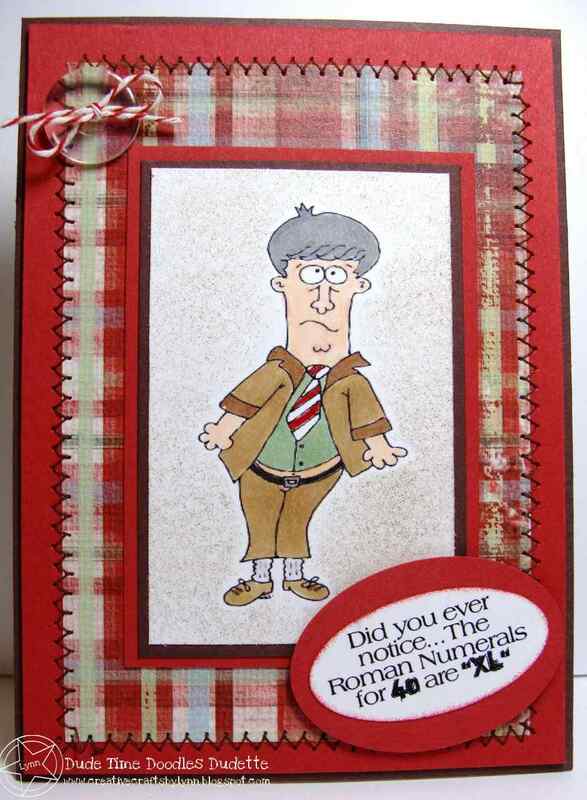 It MUST be a masculine themed card as that's what the Dudes are all about. 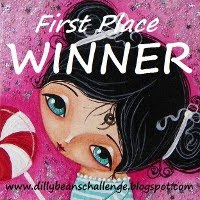 The winner will be announced next week and you could be selected as the Top Blog or one of the Top Three - plus there will be a generous prize for the winner. So be sure and head on over to Dude Time Doodles and submit your entry. This is Hammock Harold and he can be found in Boni's STORE. How about this cute image for a Father's Day card! 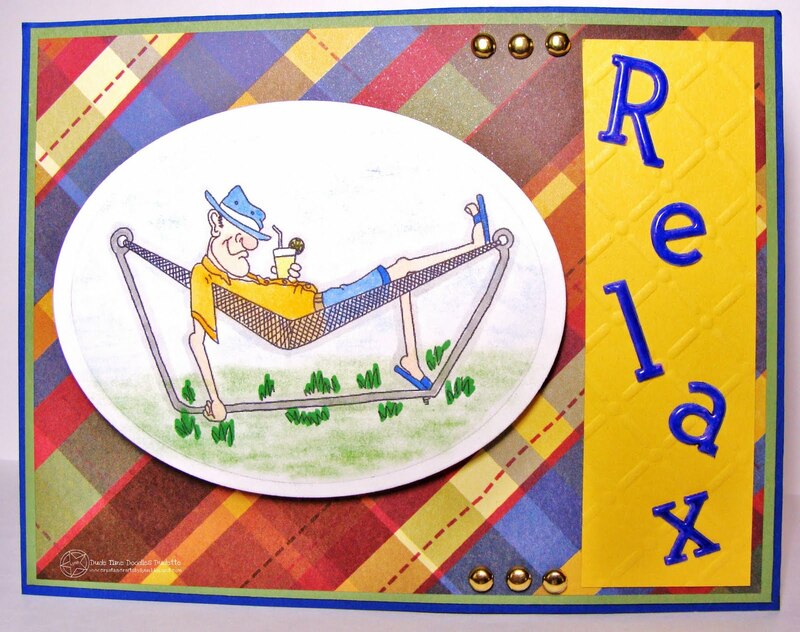 He's relaxing and chillin' which is what all dads need to do on "their day". 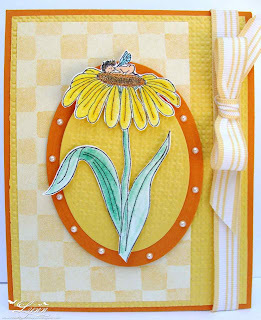 I used a Texturz plate from SU on the yellow and the patterned paper is from Paper Studio. The "Relax" letters were actually pink (yes, I said PINK) puffy stickers! I colored over the pink with a blue SU marker and it worked perfect! It's amazing sometimes what you can do with limited supplies! 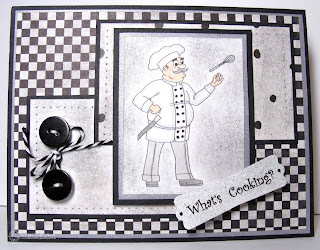 I'll be entering this in the challenge over at Stamping Scrapping Challenges Central ( masculine) and also at Karen's Doodles Challenge (Father's Day). Thanks for stopping by................and be sure and check out Dude Time Doodles to submit your entry.